Cali Ann’s Creations – Featured Shop! The holiday shopping season is here, and this week’s featured shop is CaliAnnsCreations! CaliAnnsCreations is filled with accessories for every season! CaliAnnsCreations was born July of 2012 and has been growing and expanding ever since. Kalee’s shop is full of earrings, bows, and a other hair accessories. All materials Kalee uses are from small businesses, like her own. You can follow Kalee’s shop on Facebook page too. Winter is coming! Stock up at Pikeys! This week’s featured shop is Pikeys! This shop is filled to the brim with amazing cold weather knitwear, hair accessories, jewelry, and more. Pikeys is owned and operated in Washington state by Vikki Pike. Vikki is a self-taught wizard with knitting needles. Her creations will take your breath away. She specializes in accessories that are modern, and touched with color and a bit of whimsy. Looking through her shop, you will find references to some of your favorite items, as well as astounding items that you never would have imagined, but won’t be able to live without. Pikeys will have you wishing that it was winter all year long! Vikki’s shop is full of all sorts of wonderful scarves, cowls, shawls, hats, beanies, head wraps, headbands, gloves, hair ties, chokers, and even a few patterns. Many items are ready to ship and some are made-to-order. Vikki welcomes custom orders and adjustments on existing items, including special sizes or colors. So, there’s something for everyone at Pikeys. Pretty Byrd Designs – Featured Shop! Just in time for holiday shopping; this week’s featured shop is PrettyByrdDesigns! PrettyByrdDesigns is overflowing with original paper creations! You can find a beautiful card or small gift for any occasion. PrettyByrdDesigns is owned and operated in Ohio by Beth Byrd. Beth is an amazing artist whose creativity shines through in every item she handcrafts. She is particularly drawn to flowers, nature, and botanical themes. Her love of the past is often seen in her work, which tends to express a vintage style. Beth’s shop is filled with greeting cards, decorative boxes, journals, mixed media art, and other original paper craft items. She is wonderful at working with her customers to fashion special, one-of-a-kind creations. Beth is a proud member of the design team for Ewe-N-Me Printables, as well as a crew member for Canvas Corp Brands/7 Gypsies. Additionally, her cards have been featured in “Take Ten” (Spring 2015) and “The Stampers’ Sampler” (Spring 2014 and 2015). You can stay up-to-date with Beth and all of her amazing goodies by following her blog. Alchemy Home Decor – Shop Feature! This week’s featured shop is Alchemy Home Decor! This shop is filled to the brim with one-of-a-kind items for the home. Everything you’ll find in this shop is simply beautiful. AlchemyHomeDecor is owned and operated in Virginia by Sheila. She started drawing at a very young age; the creative process has always been something that motivates and soothes her. She is currently a full time middle school teacher, but still finds time to run TWO etsy shops: AlchemyHomeDecor and FurnitureAlchemy. She spends her evenings and weekends fulfilling her need to create. She enjoys flea market hunting, sewing, and painting in her spare time. This shop carries a wide selection of home decor, including; pillows, mugs, glasses, plates, canisters, tea towels, wooden signs, picture hangers, scarves, totes, necklaces, laptop sleeves, downloadable art, and Christmas decor. 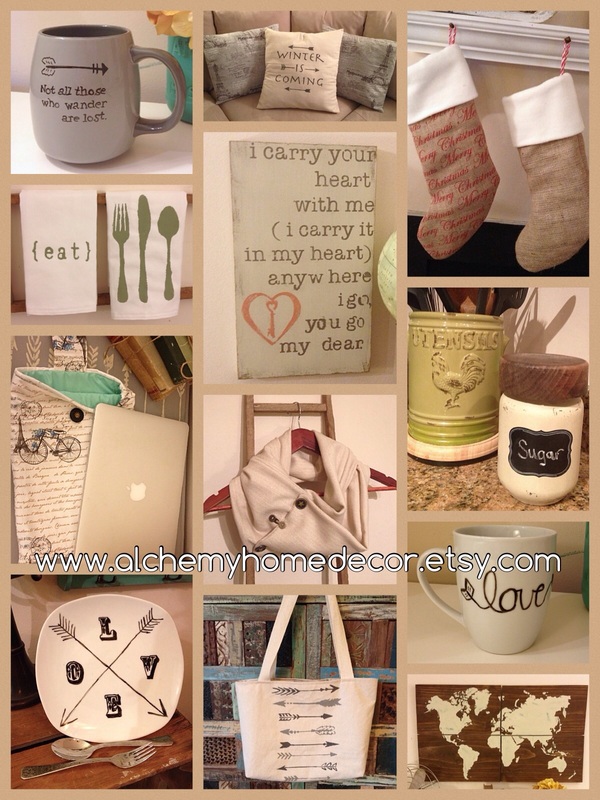 Handmade and hand painted; AlchemyHomeDecor is inspired by vintage, rustic tones with a modern twist; creating one-of-a-kind accents for the home.